During its many years of presence in our country’s intellectual and cultural life, the Aikaterini Laskaridis Foundation is constantly evolving and has gradually established itself as a prominent influential cultural authority. Its activities are supported by distinguished representatives of all fields of culture and science. The Foundation’s aims are the promotion of Greek Letters and Culture in general, as well as the promotion of Historical and Maritime Research and the function of the large Historical and Lending Libraries. The Kaiti Laskaridou Library is founded in Neo Phaliro by Konstantinos Laskaridis in the memory of his late wife Kaiti. The yearly Kaiti Laskaridou Literary Competition is inaugurated. Eligible to apply are all Secondary Education students of the prefectures of Piraeus, Cyclades and Dodecanese. The first book by the Aikaterini Laskaridis Foundation is published. It is the monograph “Andreas Miaoulis (1769 – 1835): From enslaved to free Greece”. Since then there have been nine more publications of the Aikaterini Laskaridis Foundation. 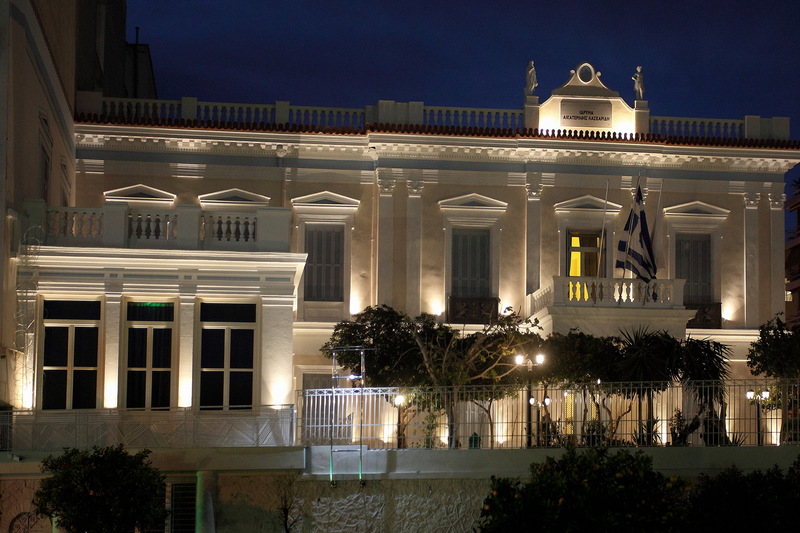 The offices of the Kaiti Laskaridou Library are relocated to a neoclassical building in Piraeus, on 169, Praxitelous and Bouboulinas Str., as the Library becomes part of the Aikaterini Laskaridis Foundation. The Aikaterini Laskaridis Foundation is established by Presidential Decree, with the signatures of the Ministries of Education, Culture, Shipping and Finance. Its founders are Panos and Marilena Laskaridis. The Foundation’s website www.laskaridou.gr goes live. The body of the Foundation’s Scientific Advisory Committee is formed. The member of the Academy of Athens and Professor of the University of Cambridge Athanassios S. Fokas is elected President of the Committee. The renovation and restoration of Greek lighthouses begins. The first renovated lighthouse is that of Cape Tainaron (Matapan), with the Lighthouses of Cape Maleas (2009) and of Dana, Poros (2011), to follow. The first educational programmes of the Foundation are presented in schools outside Attica, specifically in schools of the fire-afflicted areas in the Peloponese. Between 2008 and 2013 the Foundation has organized seven educational visits to schools of fire-affected and remote and isolated areas schools. The archive of Kostoula Mitropoulou is donated to the Foundation. A specialist team undertakes the processing and classification of the archival material. The project is completed in September 2010. The Foundation’s new building on 36, 2nd Merarchias and Aktis Moutsopoulou Str. opens its doors. 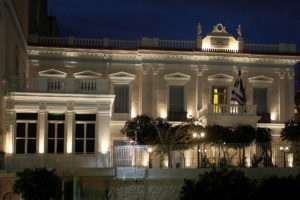 Widely known as the Stringos mansion, the building for years has been the headquarters of the French Institute in Piraeus. The Library’s Maritime Section is organized. The Foundation starts a cooperation with the City University London, hosting in its premises the University’s LLM in Maritime Law. The Maritime Collection of the Aikaterini Laskaridis Foundation is presented to the public for the first time. The digitization of old and rare publications and archival material relating to lighthouses begins. The Agreement of Cooperation between the libraries of the Aikaterini Laskaridis Foundation, the Eugenides Foundation and the University of the Aegean is signed; the creation of the Triangle of Maritime Libraries is decided. The Foundation acquires the Library of Baron Leo Delwaide, one of the most important libraries internationally in bibliography and scientific periodicals on the subject of International Maritime Law. The Social Solidarity Programme is implemented; in cooperation with the Municipal Welfare Service of Piraeus and the Doctors of the World (MDM) is responsible for providing meals to minors from families facing serious financial problems. The Foundation establishes its Historical Library, which includes archives and libraries donated to the Foundation by important personalities of Letters and Sciences. The 1st National Literary Competition in memory of Kaiti Laskaridou, addressed to Secondary Education students, is announces. Since then, the Competition is held annually. The Foundation’s Historical Library is continuously enriched. The Historical Library comprises library collections numbering more than 250,000 book titles as well as priceless collections of literary and historical records, which include manuscripts, correspondence and audio-visual material. The Lending Library is relocated to a new building on 173 Kountouriotou Str. The building provides a Reading Room and a Computer Room. The 1st National Competition in Violin – Ismene Crhysochoou-Karter and Georgios Karter Scholarship is held, awarding a scholarship for postgraduate violin studies abroad. The Competition will be held annually, awarding a new scholarship every year. The Aikaterini Laskaridis Foundation presents for the first time on the internet Travelogues: Travellers’ Views, a groundbreaking project on the most significant travellers’ editions, concerning the Greek world, through the website http://eng.travelogues.gr/. This valuable material is indexed, documented and digitized, and includes more than 6,000 publications and over 15,000 images. The Foundation’s Library celebrates its 20th anniversary. The Foundation becomes actively involved in the project “Return to Antikythera”, in cooperation with the Woods Hole Oceanographic Institution of Massachussets and the Ephorate of Underwater Antiquities of the Hellenic Ministry of Culture. The project is a systematic return to the ancient Antikythera Shipwreck, and will continue in the next years. How to get there by bus?